Although we would have loved to keep Tim Paul‘s Christmas background (with the falling snow) up all year round… We though it was about time we said goodbye to Christmas again and hello to a wonderful new year! So until our top secret new background arrives we’d like to welcome back Jose Pardo‘s amazing floating castles. You can find out more about Jose’s background and how it came to be by following the link. Link: Jose Pardo’s floating castles for hire an illustrator. As soon as we saw the Lemurs we were sold on the piece! We think WB did a wonderful job, what do you think? Well… It’s been a very wet summer so far, so it seems appropriate that our current summer background on hai is a maritime scene. We’ve had it up on the site for almost a month now and the artwork is by the very talented Marc Scheff. The above image shows the finished work, but you may or may not have noticed the artwork being used on the site is slightly different to accommodate the website’s layout and requirements, as is normally the case with most of our website backgrounds. Marc started working on this background several months ago, although obviously it didn’t take him several months to produce. We stopped and started on it a few times as time allowed. Sometimes I waited for him and sometimes he was waiting for me, but we never rush our backgrounds and never enforce a deadline. At the time when he sent me the sketch and previews I didn’t know he had been fighting a creative block and had played with a number of other ideas before deciding on the one that stuck and finally became a hai background. As you can see from his idea montage there was no shortage of interesting concepts. Creative block? Rubbish! To me a creative block is a blank page. I think Marc’s just a perfectionist, which isn’t a bad thing, especially when you’re as talented as him and produce beautiful work time and time again… He sent me the montage after the final background had been produced as I had requested some of the working drafts from him for this post. Going back to original process, the next image Marc sent me resembled what would become the final image, but not the actual background. After a couple discussions, a number of changes were made and I was sent this mockup. As you can see the artwork has become wider and shorter to accommodate a more standard screen size. At this point the background was almost there and ready for Marc to produce the final image that would become the one we would actually use on the site. Once the final artwork had been produced, there were a couple small tweaks and a bit of image/file optimisation to do which Marc and I did with ease. You can see the finished background on hire an illustrator and the finished artwork on his personal website. Marc was great to work with and very on the ball when it came to working with layouts and web based imagery. I wouldn’t hesitate to work with him again in the future. 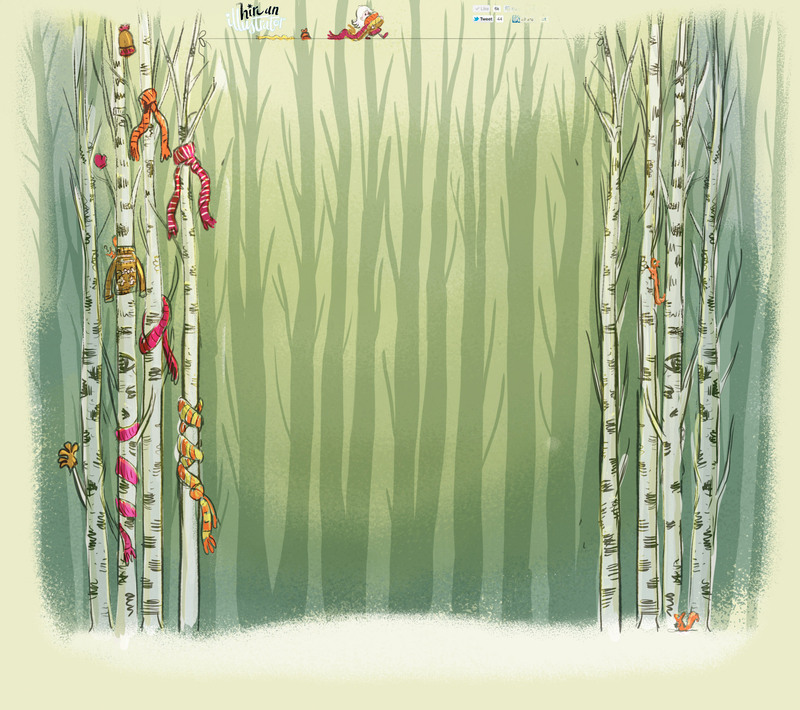 A few weeks ago leading up towards Christmas we asked the loverly Miriam Bos to create a winter background for the hire an illustrator website. We love the way it turned out and we hope you do too! Here’s the finished article in all it’s glory. Backtracking a bit, here is the original rough/sketch. Miriam was a joy to work with and very quick off the mark. From the word go, she knew exactly what we were after. Miriam explained to us that the image had a story behind it and it was the story that was the basis for the concept. There was an elf who thought that the winter was so cold that the trees needed clothing to keep them warm! After receiving the rough I made a few small suggestions, like moving the squirrels onto the inner trees to give them a bit more screen time, but all in all I was happy for Miriam to proceed to produce the final image. The final was then produced and we went back and forth a few times, knocking off a few pixels here and there, optimising the image for web, and arranging it to work with the layout of the website and logo. Once that was all done with a couple days to spare we got the new background up for Christmas! I’m please to announce that we have a new background image on hire an illustrator, created by the talented Jose Pardo. The new background wasn’t just a simple case of asking an illustrator whether they had a piece of work that could just be reused as-is on the site… What we wanted was something original that reflected the illustrator’s style, without being too dominating on the page, and I’m really happy with what Jose produced and how it turned out. As the hai website is all about the illustrators and illustration I’m going to share with you how we got to the final piece. Here is the first sketch that Jose sent me a few weeks ago. Following the first sketch, Jose started to flesh it out and it was only a short period of time before he sent me this next image. After I had reviewed the above piece, I let Jose know how well things were proceeding and that the image looked great. I then left it in his capable hands to complete the image with no set deadline for delivery as the deadline was at his discretion. The next thing I heard from him was that he was tweaking a few things and working on a dragon! Later the same day he emailed me the following image. Click on the image for a larger preview, so you can see a bit more detail. I did like the white one, but it felt more right to go with the blue one still. So I then took the blue one and got to work on the arrangement of the elements to make it fit with the website framework. At this point I actually uploaded what I had to the site and sent Jose a link to it, so it could be seen as a live preview. I had squeezed the floating castles into the top section and put a cloud behind the main large one to try and balance the overall look. The red from behind the hai logo was also removed. After I sent Jose this version, being the perfectionist he is, he then re-did the layout and sent me another copy which became the final version which can now be seen on the site in all its glory. Click on the image for a large preview or go to our main site to see it in action. A big thank you, Jose, for all your hard work! Since we redesigned the Hai! site in March 2010, the site’s background image has been adorned by Jeff Miracola‘s very cool, but creepy cute Monkey-Bears! Well, today that all changes! LouLou & Tummie have given us another amazing background to throw into the mix. We’re hoping to add more brilliant backgrounds to the collection in the future, so watch this space!